A new joint publication by GRAIN and the World Rainforest Movement (WRM) looks at the dangers for peasant communities from one of the main carbon market mechanisms on the table at the upcoming UN summit on climate change in Paris. Governments will meet this December at the 21st UN summit on climate change in Paris. As in previous years, proposals that allow a way out for those countries unwilling to sufficiently reduce fossil fuel consumption will be high on the agenda of COP 21. REDD+, a mechanism to reduce emissions from deforestation and forest degradation, is one of these proposals that proponents hope will be included in the final agreement expected from the summit. The idea behind REDD+ is that countries, mainly in the global North, provide funding for measures that claim to halt forest loss in tropical countries and, in return, the countries providing the funds can claim credit for the emissions supposedly saved through REDD+ activities. For this mechanism to work, elaborate yet unverifiable calculations have to be carried out to determine how much carbon is stored in a forest. Once the resulting figures have been transformed into units of carbon dioxide equivalents, the currency of the carbon market, they can be priced and traded and countries can count them towards the emission reduction pledges they are expected to commit to at the Paris COP. While REDD+ is a convenient proposition for governments in industrialised countries, it is one of the most dangerous proposals on the table at COP 21 for peasant communities. 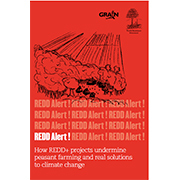 A new publication by GRAIN and the World Rainforest Movement (WRM) shows why REDD+ is not a solution to climate change that can help peasants reduce emissions, adapt their farming practises to a changing climate and increase yields, as its proponents claim. The reality is that REDD+ programmes put the blame for deforestation and emissions on peasant farming practices that have nothing to do with climate change. REDD+ projects also undermine local food systems by preventing traditional farming practices and restricting people’s access to lands and forests. Most REDD+ activities place limits, quite often severe limits, on the use of forests by local communities for shifting cultivation, for gathering and for other subsistence activities. Restrictions on hunting, fishing, grazing or cutting some trees for the construction of homes or canoes are also regularly established and enforced by REDD+ project owners, often with the support of armed guards. At the same time, large-scale drivers of deforestation, like industrial logging, infrastructure mega-projects, mining, large hydro-dams, and, above all, industrial plantations for trees, oil palm or soybeans, continue without restriction. The publication provides examples from Mozambique, Nigeria, the Democratic Republic of the Congo, Madagascar, Brazil, Indonesia, Peru, Uganda and Kenya to illustrate five key patterns that make REDD+ so harmful for peasant communities. These include: 1) how REDD+ blames peasant farming practices for deforestation and emissions; 2) how REDD+ rarely benefits local communities but is good business for carbon companies, international conservation NGOs, consultants and industrialised countries; 3) how REDD+ undermines food sovereignty and 4) community control over territories; and 5) how REDD+ facilitates the expansion of corporate agriculture. REDD+ is not just a false solution to the urgent and critical problem of climate change. It reinforces the corporate food and farming system that is largely responsible for climate change, has robbed many communities and forest peoples of their territories and undermines the food and agricultural systems of peasants and indigenous peoples that can cool the planet. Peasants are already proving that it is possible to ‘feed the world’ without the massive emissions produced by the export-led, industrial model of agricultural production. Giving lands back to small farmers and indigenous peoples is the most effective way to deal with the challenges of feeding a growing global population in an era of unpredictable climate change.